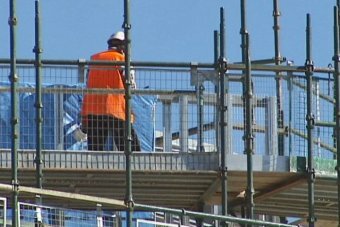 Building approvals bounced in June, led by a spike in approvals for apartment blocks, but economists say housing construction continues to gradually decline. Approvals for new homes jumped 10.9 per cent in June, the Australian Bureau of Statistics said, well above the one per cent increase the market had expected. Approvals for ‘other dwellings’, which includes apartment blocks and townhouses, surged 20 per cent, and approvals for private sector houses rose 3.4 per cent. June’s strong growth in approvals follows significant falls in recent months and points to a gradual decline in housing construction, Commonwealth Bank senior economist Gareth Aird said. Over the year to June, building approvals were down 2.3 per cent, with apartments and townhouses down 6.6 per cent and houses up 1.4 per cent. “The 20 per cent spike in the highly volatile multi-units over the month continues the recent pattern of big monthly falls followed by solid rises,” Mr Aird said. “The trends in the building approvals data, coupled with strong underlying demand for housing, underpins our view that the decline in residential investment will be gradual and elongated. ANZ senior economist Daniel Gradwell said the sharpest falls in approvals appear to be in the past, but the winding down in housing construction will continue. “We still expect further declines will come through over the second half of 2017, driven by tighter credit conditions and higher interest rates for investors, although the size of these falls will likely be tempered by the fact that the RBA is not yet embarking on a tightening cycle,” he said. The Australian Prudential Regulation Authority capped interest-only mortgage lending on March 31, telling lenders to limit higher risk interest-only loans to 30 per cent of new residential mortgages. That set off a fresh round of rate increases by the major lenders, with banks repricing their loan book to make interest-only and investor loans more expensive. The jump in June building approvals was driven by a 24.8 per cent rise in NSW. There was also an increase in Western Australia (19.6 per cent) and Victoria (6.1 per cent), while approvals fell in South Australia (down 20 per cent) and Tasmania (down 8.3 per cent).